Almighty God, full of Mercy remember the generation of Jewish children that were reared for slaughter. Remember the multitudes of children, who in their short lives never experienced joy, knowing only hunger, deprivation and fear. Almighty God, open our hearts to the plight of the deprived and hungry children of today. By helping them, we shall keep the memory of the perished alive. Amen. From all occupied areas, children were deported to Auschwitz since 1942. Small kids were usually killed immediately because they were too young to work. Mothers who held their babies in their arms were gassed together with the children. A child made a mother look like "unable to work". Also grandmothers who were with their grandchildren, were killed. If the mother was seen as "able to work" she would be sent to the camp. 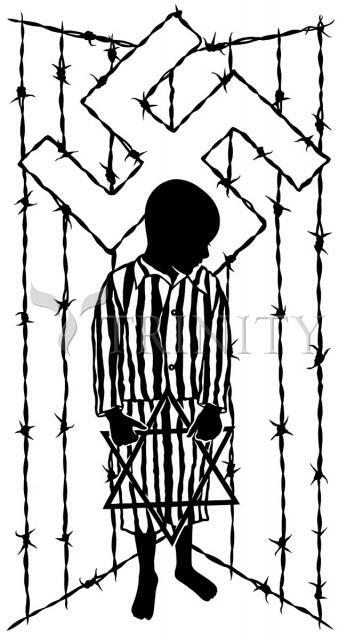 Families could only stay together in the gypsy camp and the Theresienstadt family camp. Boys, who survived the selection, were first assigned to work as masons at the building of the crematories in Birkenau. The food rations were not sufficient for such hard work, thus the boys suffered from malnutrition. In 1943, when the works in Birkenau were finished, the boys of the "school of masons" were taken to Auschwitz I and, together with other children, killed by phenol injections. Some kids were in the camp constantly, within the blocks and in the labor commandos, where they had to do assistant works. There were German Kapos who kept boys in order to satisfy their perverse sexual desires. It was prohibited to drink water in the camp because of its contamination. Nevertheless, the thirsty children drank it and thus, were exposed to all diseases raging in the camp. As a consequence of the complete destruction of their little bodies it was often impossible to find out which illness had caused their death. "The children's block in the gypsy camp was in no way different to the block of the adults. But the poverty and the misery of those little mites was touching in the midst of the heart. Like the adults, the kids were only a mere bag of bones, without muscles or fat, and the thin skin like parchment scrubbed through and through beyond the hard bones of the skeleton and ignited itself to ulcerated wounds. Abscesses covered the underfed body from the top to the bottom and thus deprived it from the last rest of energy. The mouth was deeply gnawed by noma-abscesses, hollowed out the jaw and perforated the cheeks like cancer. Many decaying bodies were full of water because of the burning hunger, they swelled to shapeless bulks which could not move anymore. Diarrhea, lasting for weeks, dissolved their bodies until nothing remained."